I discovered Philip Roth at age 17. In retrospect, it was the ideal age for a young Jewish man growing up in the suburbs of New Jersey to discover this “pre-eminent figure [of] 20th-century literature”. I owe Roth a great debt. He showed me that the lives of Jewish men in suburban New Jersey could embody both romance and the “larger than life” elements that make stories big and give meaning to our existence. In his first book, Goodbye Columbus, consisting of a novella plus five short stories, the lead story (“Columbus”) runs only 97 pages in the paperback edition that I have carried with me through numerous households and two countries (see image below). The story charts a doomed summer romance between Neil Klugman, a lower middle class young man who works in the Newark library, and Brenda Patimkin, an over-indulged upper middle class sculpted beauty who lives in suburban Short Hills and studies at Radcliffe College (Harvard University). that any truly literate audience could seriously be interested in his store of tribal secrets, in what he knew, as a child of his neighborhood, about the rites and taboos of his clan – about their aversions, their aspirations, their fears of deviance and defection, their underlying embarrassments and their ideas of success. Although the book was published in 1959, I didn’t discover it until much later, around the same time that the movie version (1969) was released, starring Richard Benjamin as Neil and Ali McGraw at Brenda. As a long-time writer and lecturer on Jewish film, I frequently use Goodbye Columbus (the movie) as one of my best examples. Set in a totally insider Jewish environment, the film neatly captures the same feeling – the American-Jewish suburban experience – as the book, although sadly updated the action to the Bronx and Westchester from my beloved New Jersey. It does, however, present – satirically, mostly lovingly, and never less than critically – a good range of Jewish suburban characters. Two scenes stand out in my memory: Neil’s first dinner at Brenda’s house (click here for a 2’26” YouTube clip) and the infamous and frequently criticised over-the-top Jewish wedding scene (short YouTube clip here). In my last year of high school I produced a “term paper” that analysed Roth’s first four novels: Goodbye Columbus, Letting Go, When She Was Good and Portnoy’s Complaint. The second and third novels are far from Roth’s best, and – despite widespread critical acclaim – I never warmed to “Portnoy”, which became a truly terrible film. My term paper accurately predicted that Roth would become one of America’s great modern novelists; my then English teacher disagreed. Other than our New Jersey Jewish upbringing, Roth and I shared one other salient fact: both of our fathers worked for the Metropolitan Life Insurance company, now known as MetLife. Roth has continued to play an important role in my literary and personal life since those high school experiences – he has his own category in my writing blog – although has been far from the lodestar role he played at age 17. My favourite Roth books are his “political” novels: American Pastoral (which became an under-released film that never made it to Australia), I Married a Communist, The Human Stain (read my review of the 2004 film here) and The Plot Against America, a frightening book which has taken on unexpected new meaning in the age of Trump. Roth also played a role, albeit indirectly, in my own romantic life choices. I was introduced to my wife some years ago by a Jewish yoga teacher from New Jersey whose father taught English to … yes, Philip Roth … at Weequahic High School in Newark, New Jersey. In more recent years, I reviewed The Humbling (2010) for the Australian Jewish News, and have closely tracked the adaptation of Roth’s books into films, most recently reviewing the film adaptation of Indignation (2016). I felt an immediate intimacy with the novel’s author, Philip Roth. Though two generations separated us, I felt that he spoke directly to me or, in some mystical, incoherent sense, spoke from somewhere inside my brain. I had read novels that frightened and delighted me, made me laugh, made me question—Roth’s writing did all that, but it also elicited a spookier response. I had never before read a writer who knew me. It was a shock to discover that others felt the same way—including many who were not Jewish teenage boys. Very few authors have a whole journal devoted to their work. Philip Roth does, published by Purdue University Press since 2005. Wikipedia has produced a full bibliography of Roth’s work. The New York Times has provided a “starter kit” of what Roth novels to read – although I don’t agree with their choices: no reference to The Plot Against America – seriously? What’s fascinating is how Roth reached so many non-Jews, such as ABC Radio presenter Sarah Kanowski, interviewed about Roth’s legacy on Late Night Live in May. For more analysis of Goodbye Columbus, read Saul Bellow’s original review of the book in the July 1959 edition of Commentary, and Elaine Blair’s rethinking of the book’s ending in The Paris Review, April 2017. Here’s further proof that Australia and the USA – despite being linked by the English language and a long and deep friendship – are worlds apart in social, political and artistic cultures. “The Forward” – possibly the oldest and still the best Jewish newspaper in the USA (originally published in Yiddish as “The Jewish Daily Forward”, and read religiously by my grandfather Sol) back in the 1930s – has just published its list of the 50 Jews in the USA making the most impact in 2015. Politics: Presidential wanna-be (Vermont Senator) Bernie Sanders, as well as New York Senator Chuck Schumer (uncle of Amy, more on her later) and Congressman Jerry Nadler (New York City – whose district we lived in during our 2011 residence). Culture: TV show “Transparent” director Jill Soloway and actor Jeffrey Tambor. And number one on the list: actress and comedienne Amy Schumer (“Trainwreck”, and one of “Time” magazine’s “top 100”). And so the list goes. Fascinating, yes. But from the perspective of Jews who live outside of the USA, how many of them are “household names” here in Australia (or anywhere else outside of North America), even in the Jewish community? Remarkably, astonishingly, few. Check out the list yourself. Of the 50 (see the complete list below), I only count 12 that I can name with assurance – AND I think I am tied in to US culture and politics. The ones I recognise are Amy Schumer, Bernie Sanders, Michael Dell (computers), Sheldon Adelson (casino magnate, Jewish philanthropist and conservative activist), Ben Lerner (post-modern novelist), Jill Soloway, Jeffrey Tambour, Jon Stewart (TV host), Sarah Koenig (NPR’s “Serial” podcast), Jerrold Nadler, Charles Schumer and Dianne Feinstein (California Senator). 1. Jews are over-represented in Hollywood, especially in some key creative and some high-profile positions. 2. The Jewish “influence” over Hollywood is overstated by an enormous amount – even by Jews themselves. 3. There are lots of good historical reasons why Jews gravitated to work in the American film and television industries – primary among them because historically they were locked out of a large number of other industries and professions. Hollywood, for a complex set of geographical, historical and economic factors, was open to “the Jews” at a key point in Jewish and film history, and has remained relatively so since. And here’s a good example of point number two. Premiere, a monthly film magazine published in the USA from 1987 to 2010, used to present its annual “Top 100 power list”. I analysed the “power list” every year over a ten+ year period (approximately 1995 to 2005), to see how many of the “top 100” on the list were, in fact, Jewish. When I gave lectures on Jewish representation in film, I would ask the audience how many on the list did the audience think were Jewish. These were Australian Jewish audiences, reasonably sophisticated in media, in film and with a high degree of Jewish “awareness”, and not prone to over-estimating Jewish power in the world. The average guess was about 50%, with some people estimating as high as 90%. The lowest estimates – yes, the absolute lowest – only just met the reality: between 22% and 25%. Over the ten or eleven years in my survey, the top number was about 29%, and the lowest 20%. Okay, so 25% is a lot, you might argue, especially when Jews make up only about 2.5% of the American population. Yes, it’s an over-representation by a factor of ten, but far from control. And the further down the list you go, the fewer Jews actually appeared. I strongly suspect that the second 100 (if totalled) would be significantly less. 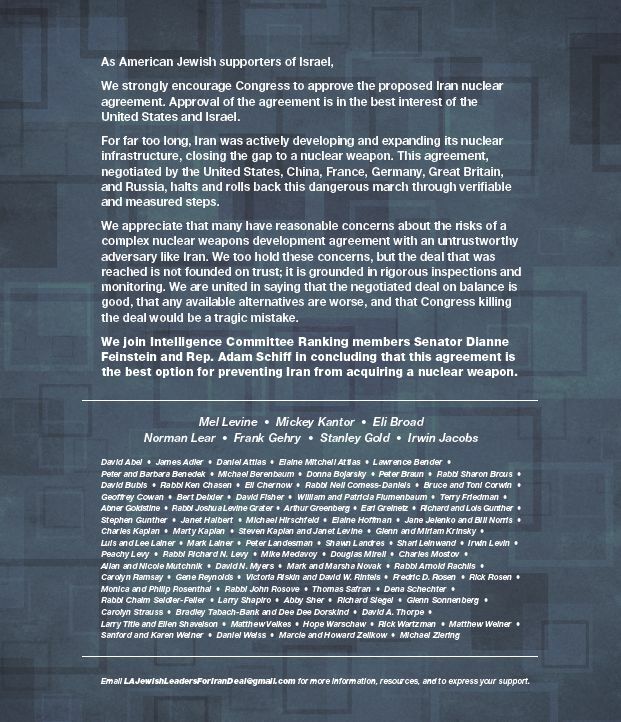 So that’s the some of the background of the recent headline coverage of “Hollywood Jews support the Iran deal”, with some pretty strong criticism of the full-page advertisements that appeared in the Los Angeles Jewish Journal last week. We Jews – and many non-Jews, both sympathetic to Jewish causes and not – are pretty alert to “Jewish power” issues. So when the “Hollywood Jews” make a statement together, well … we notice. And we notice a lot more than when it’s a simple group of Jews, because of the nature of Hollywood film history. “Cleveland Jews” making a statement just doesn’t have the same ring to it, does it? So here, below is a copy of the advertisement. You can find a lot more information on the Hollywood Reporter website. Even The Times of Israel insisted on calling the group “Hollywood Jews”, when the more accurate description – one used by the group itself – was “Los Angeles Jewish leaders”. Mel Levine, Mickey Kantor, Eli Broad, Norman Lear, Frank Gehry, Stanley Gold, Irwin Jacobs, David Abel, James Adler, Daniel Attias, Elaine Mitchell Attias, Lawrence Bender, Peter and Barbara Benedek, Michael Berenbaum, Donna Bojarksy, Peter Braun, Rabbi Sharon Brous, David Bubis, Rabbi Ken Chasen, Eli Chernow, Rabbi Neil Comess-Daniels, Bruce and Toni Corwin, Geoffrey Cowan, Bert Deixler, David Fisher, William and Patricia Flumenbaum, Terry Friedman, Abner Goldstine, Rabbi Joshua Levine Grater, Arthur Greenberg, Earl Greinetz, Richard and Lois Gunther, Stephen Gunther, Janet Halbert, Michael Hirschfeld, Elaine Hoffman, Jane Jelenjo and Bill Norris, Charles Kaplan, Marty Kaplan, Steven Kaplan and Janet Levine, Glenn and Miriam Krinksy, Luis and Lee Lainer, Mark Lainer, Peter Landesman, Shawn Landres, Shari Leinwand, Irwin Levin, Peachy Levy, Rabbi Richard N. Levy, Mike Medavoy, Douglass Mirell, Charles Mostov, Allan and Nicole Mutchnik, David N. Myers, Mark and Marsha Novak, Rabbi Arnold Rachlis, Carolyn Ramsay, Gene Reynolds, Victoria Riski and David W. Rintels, Fredric D. Rosen, Rick Rosen, Monica and Philip Rosenthal, Ranni John Rosove, Thomas Safran, Dena Schechter, Rabbi Chaim Seidler-Feller, Larry Shapiro, Abby Sher, Richard Siegel, Glenn Sonnenberg, Carolyn Strauss, Bradley Tabach-Bank and De Dee Dorksind, David A. Thorpe, Larry Title and Ellen Shavelson, Matthew Velkes, Hope Warschaw, Rick Wartzman, Matthew Weiner, Sandford and Karen Wiener, Daniel Weiss, Marcie and Howard Zelikow and Michael Ziering. It’s an interesting list, with a few well-known names, including Matthew Weiner (“Mad Men”), Eli Broad (philanthropist and entrepreneur), Norman Lear (TV mogul) and Frank Gehry (the architect, not a media person), Mike Medavoy (a genuine Jewish film mogul), Michael Berenbaum (Holocaust film scholar) and Mickey Kantor (former politician). A fascinating group, but (a) not a “power list” of Hollywood personalities (how many do you recognise? ); and (b) includes lots of non-entertainment types. Missing are most of the biggest actor, director and producer names. Not exactly what I’d call a “Hollywood Jewish coalition”, by any means. However it suits the media to frame this as a “Hollywood” (read: film and television) list. “Ruth Marcus Patt – Author, Historian, Philanthropist, and Woman of Valor”. That’s the title of the most recent bulletin of the Jewish Historical Society of Central New Jersey, devoted to celebrating her life. Ruth was a great New Jersey Jewish leader who has just passed away at age 95. She was also my aunt, having married my mother’s brother Milton. Ruth’s achievements have been detailed in a number of places. Aside from the Jewish Historical Society, you can read her official obituaries from the Home News Tribune (published on 25 February 2015) and the New Jersey Jewish News. Her life has also been detailed in the book Past and Promise: Lives of New Jersey Jewish Women. In brief: Ruth graduated Douglass College (now part of Rutgers University) in 1940, with a BA in Sociology and a minor in Psychology. The then worked as a psychiatric social worker at Marlboro Psychiatric State Hospital before getting married to her husband Milton (my uncle) and travelling with him during the Second World War. She lived a life devoted to community service, including the Anshe Emeth Memorial Temple in New Brunswick, where she served as the President of the Sisterhood, a Board member and a 15 year period of editing the Temple newsletter. I know her writing well: for many years she wrote a family newsletter, entitled “The Colony House Observer”, named after the New Brunswick apartment building that she lived in. 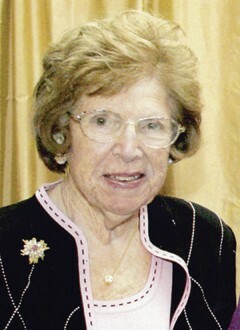 Ruth devoted much of her energy to Jewish history, as the founder and leading light of the Jewish Historical Society of Central New Jersey. She wrote four books and numerous other articles on Jewish life in New Jersey, including The Jewish Scene in New Jersey’s Raritan Valley, The Jewish Experience at Rutgers and Uncommon Lives: 18 Extraordinary Jews from New Jersey. In addition to her Jewish communal achievements, she served the City of New Brunswick – where she was born, raised and educated – with distinction. She chaired the City’s 300th year (“tercentennial”) celebration in 1980, which involved more than 130 events involved a wide range of ethnic, religious and racial groups. She was later recognised for her achievements with the Citizen of the Year award from the City. Other awards included the New Jersey Historical Commission’s Award of Recognition, the Douglass Society Award for Distinction in Public Service and the Rutgers University Medal. She and her husband Milton both received the Lehman Award for Service to the Jewish People. As a person and a public figure, Ruth was “larger than life.” She commanded respect, not by “commanding” but by her personality and her leadership ability. She asserted authority, not because she necessarily wanted to be authoritative, but because that’s who she was, a person who could do things, and who would make things happen. She was gracious, articulate and expressive. Ruth is survived by her sons (my first cousins) and their wives, Dr Richard and Althea Patt and Dr Steven Patt and Deborah Jamison, two grandchildren and five great-grandchildren. Along with my cousins and their families and the Jewish community of Central New Jersey, I celebrate Ruth’s life achievements and I mourn her passing. 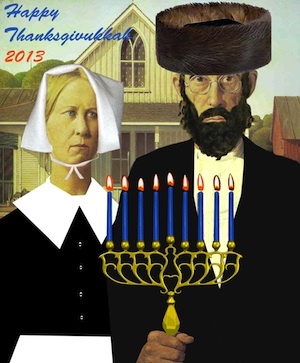 This year, the American holiday of Thanksgiving – established by Abraham Lincoln in 1863 and celebrated on the fourth Thursday of November since FDR mandated that in 1939 – and the Jewish holiday of Chanukah fall on the same day. According to Chabad.Org’s “brief history” of the two holidays, this has happened three times in history: 1888, 1899 and 1918. (There are two “Texas only” exceptions that I will ignore; not many Jews in Texas). The confluence is projected to happen again in 2070, assuming that the Thanksgiving celebratory day remains the same. And it now has a formal name: “Thanksgivukkah”, which is a variation of the “Chrismukkah” that was popularised by the American television program The O.C. during its first season in 2003. This is more than a footnote in history. Wikipedia has an extensive, carefully written and well-research web page on “Thanksgivukkah” (complete with 61 references and five additional external links). A Google search on the name comes up with more than 4.5 million hits. 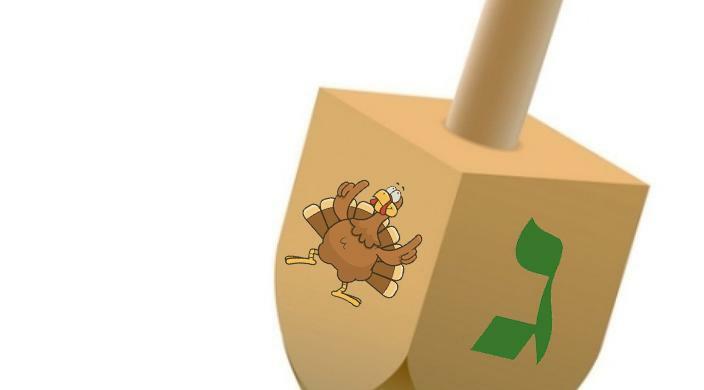 For those who do not know, Thanksgiving has always been a favourite holiday for American Jews: seen as a secular Sukkot-like celebration, American Jews have warmly embraced Thanksgiving, giving them a “holiday season” opportunity to participate as “Americans” so close to the overwhelming (and off-putting, for many) Christmas. You are currently browsing the archives for the Jewish world category.